Voice over IP (VoIP) deployments can cause unexpected or unplanned power and cooling requirements in wiring closets and wiring rooms. Most wiring closets do not have uninterruptible power available, and they do not provide the ventilation or cooling required to prevent equipment overheating. 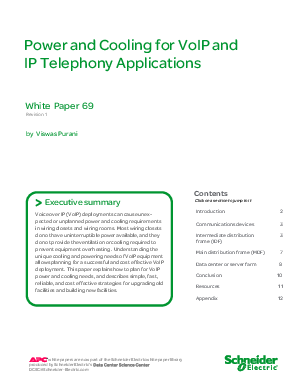 Understanding the unique cooling and powering needs of VoIP equipment allows planning for a successful and cost effective VoIP deployment.